Last week, Special Counsel Robert Mueller and his team released an indictment against thirteen Russian nationals and three organizations. Among these was the infamous Internet Research Agency and its employees, as well as the agency’s main backer Yevgeny Prigozhin, often dubbed “Putin’s Chef” for his catering business and close ties to Putin. Shortly after the indictment was made public, RT and Sputnik News, the two largest Kremlin-funded news outlets in English, as well as the Kremlin itself, started a disinformation campaign. In their efforts, they published material, which followed a familiar pattern of dismissing, distracting, distorting, and denying allegations made in Mueller’s indictment. The campaign was further amplified by elements of U.S. fringe media, which spread Kremlin talking points to denounce Mueller’s investigation into the U.S. presidential election of 2016. The amplification does not necessarily signal command and control between groups spreading the same message but does perhaps signal overlapping objectives in messaging. 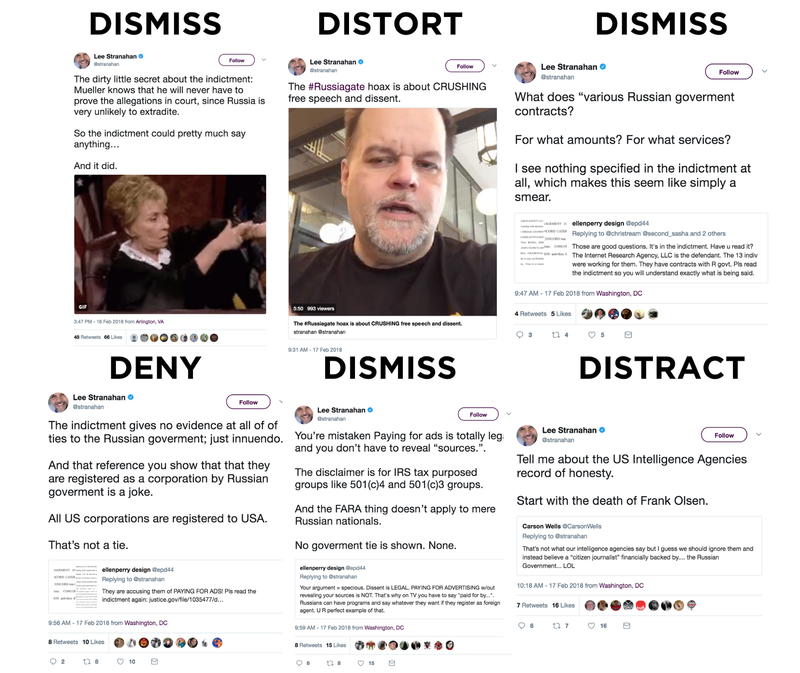 To counter Mueller’s indictment, RT, Sputnik, and the Kremlin used the 4Ds of disinformation as defined by @DFRLab’s Ben Nimmo: dismiss, deny, distort, and distract. Of the four, dismiss and deny tactics were most salient in RT and Sputnik’s coverage, and the Russian government’s statements. As a result, the Kremlin and its media outlets found themselves simultaneously rejecting the idea that Russia meddled in the U.S. election and deflating the effects of the meddling that allegedly never took place. Between February 16 and February 21, RT published seven articles that dismissed allegations in Mueller’s indictment. Sputnik News published another three. The dismissals centered around three themes. First, it argued that Russia’s alleged meddling in the U.S. presidential elections did not have any effect on the outcome of the election. Second, it claimed that the scope of Russian communication campaigns has been blown out of proportion by the media and the Democrats. Third, it insisted that Russian meddling in the U.S. Presidential elections was not pro-Trump. Neither one of these themes denied the meddling took place. RT published two articles amplifying Russian MFA and the Kremlin’s statements, and Sputnik News published another six. RT and Sputnik published seven articles attempting shift the focus from allegations that Russia interfered in the American elections. 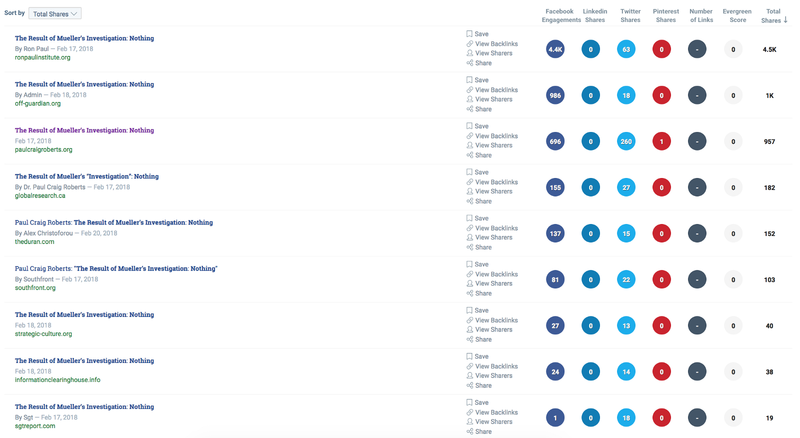 The “distract” narratives centered around two story lines. First was an example of classic “whataboutism”, a common logical fallacy often used by the Kremlin and its mouthpieces that accused the U.S. of meddling in other nations’ elections, citing examples of the U.S. involvement in foreign elections during the Cold War. The second story line focused on the allegations that presidential candidate Hilary Clinton’s team colluded with the U.S. Justice Department and the FBI to acquire the so-called Russia dossier put together by Christopher Steele. The distort narrative was less prominent than the other three. It sought to misrepresent facts about the investigation. To this end, an RT article suggested that the timing of the indictment was intended to make sure it is buried in the Friday news cycle heading into a holiday weekend in the US and another accused Special Counsel Mueller of indicting the 13 Russians to drag the probe out in order for Mueller to keep his position. Apart from the more traditional media outlets, Kremlin-paid American influencers and the fringe media also defended Russia in Mueller’s latest indictment. One such example was Lee Stranahan, the founder of Populist.TV and a co-host of the Kremlin-funded Sputnik news show Fault Lines. Shortly after the Mueller’s indictment, Stranahan started tweeting to his 85,000 followers, defending those named in the indictment. Like RT and Sputnik, Stranahan also used the 4Ds of disinformation — denials, dismissals, distortions, and distractions. Similarly, U.S. fringe and pro-Kremlin blogs spread several stories exonerating the Kremlin in the U.S. election meddling case. 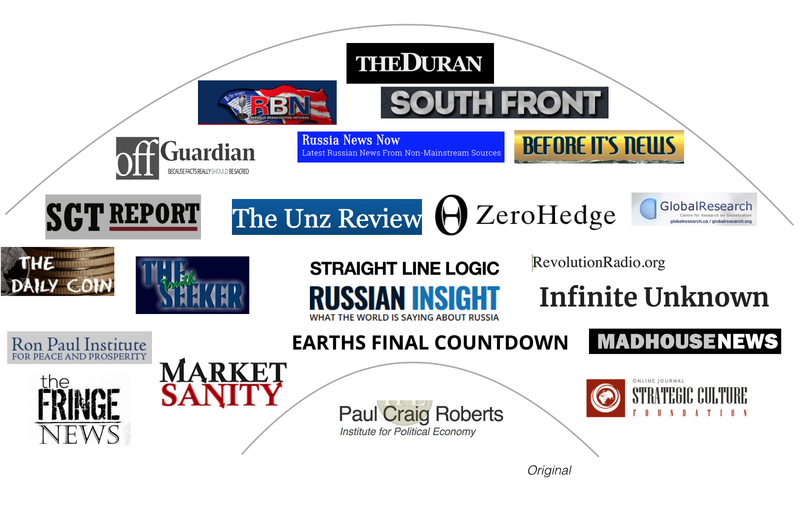 22 pro-Kremlin and/or fringe websites re-published an article written by Paul Craig Roberts, a former U.S. Assistant Secretary of the Treasury for Economic Policy turned conspiracy theorist and Sputnik News contributor. In his article, Roberts suggested that the meddling, if it took place, could not have had any effect. He then went on to claim that Mueller released the findings on a Friday because of the lack of evidence and dismissed the Kremlin’s involvement. The article was re-published by a number of U.S. fringe and pro-Kremlin websites, including the Moscow-based Strategic Culture Foundation (SCF) — run by Yuri Prokofiev, former head of Moscow’s Communist Party and member of the Soviet Politburo; The Duran, run by Moscow-based Vladimir Rodzianko; and the Ron Paul Institute, run by RT op-ed writer Daniel McAdams. The article and its copies garnered approximately 8,000 shares on social media combined, with the majority of shares coming from Facebook. The same network of websites has also re-published copies of similar articles titled “Mueller’s Investigation A Farce: Files Joke Indictment Against Russian Trolls” from a pro-Kremlin conspiracy media site Disobedient Media, The Duran article “Robert Mueller’s ’13 Russian trolls indictment’ is a COPY + PASTE job from 2015 Ukrainian Radio Free Europe post”, and an RT story titled “Russia on Mueller Indictment: All ‘Blather’ Until Election Meddling Facts Come Out”. The Russian government and media response to Special Counsel Robert Mueller’s indictment is a case-in-point of how integrated the Kremlin’s disinformation apparatus remains. A coordinated campaign ensured that everyone, from the Minister of Foreign Affairs to a Sputnik show host, repeated the same talking points and stuck to the same line of argument. The messaging amplification the Kremlin has received from the U.S. fringe media further indicated that there’s alignment of short term goals. This alignment transcends geographical boundaries through the common objectives of dismissing and discrediting Mueller’s independent investigation.